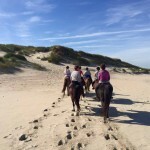 Stal Edda organizes rides trough dunes, forest and along Vlieland’s beach. These rides are guided by one of our experienced staff members. We ride in groups of 4 to 10 persons. Inexperienced riders (at least 10 years old and maximum weight 90kg (180lbs)) ride through dunes and forest for 1 hour. During the ride the principles of riding are explained and besides walk and tölt, we will definitely try to go for a canter – if you dare! Besides dunes and forest, advanced riders (at least 10 years old and maximum weight 95kg (190lbs)) also have the opportunity to experience Vlieland’s beach on the back of an Icelandic horse. The duration of the rides can be 1, 1 ½, or 2 hours. The rides begin at fixed times at 10AM in the morning and at 2PM in the afternoon. If the rides are fully booked we have an extra ride in the evening at 7.15PM. The tide determines whether we ride on the beach or through the forest, as we only ride on the beach when the tide is low. If you will be joining one of our rides, we ask you to come half an hour beforehand so you can brush and get to know your horse. All activities must be booked in advance. In high season and school holidays we advise you to book at least one or two weeks in advance to be sure you can join a ride! Also in low season, we organize rides for at least 4 persons. These rides start mostly at De Kwelder, the nature reserve, where the horses remain during this season. This ride will take 3 hours and shows you the beautiful heath and beach of Vlieland, taking you to the campsite Lange Paal, where we enjoy a cup of tea. This ride is only for advanced riders. On this ride you will be on the back of an Icelandic horse for 4 hours in total, and ride all the way from the stable to the Posthuys and back. After 2 hours on horseback we will have a break of 1 hour, during which both horses and riders can enjoy lunch at the Posthuys (not included) before we ride back to the stable for another 2 hours. Stal Edda also offers private rides, for example for people with a handicap. These rides are very limited and need to be booked in advance. For the experienced rider, who is familiar with the tölt, tölt lessons can be arranged after appointment. During this 1 hour lesson, the tölt can be better practiced. All rides must be booked in advance. You can make reservations by calling +31 (0) 562-451128 between 9AM and 5PM or by sending an email to staledda@gmail.com. If you want to join a ride within 48 hours, we ask you to bring us a visit or book by telephone.